dunno why i don't really like chocolate. a few weeks ago, there was a chocolate festival in town. it was packed with chocolaholics and they seemed to enjoy being in the middle of chocolate creations. this weekend, another assignment took me to one of the hotels in jakarta. got to shoot pictures for their bridal suite. 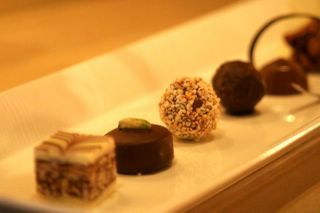 of course, chocolate was one of the items i have to shoot. the director of marketing who accompanied me, an australian lady, told me to try one of those chocolates,"you have to try this one. you should! this one is really heaven!" knowing that i don't like chocolate, the word 'should' was being emphasized. and, i tried that mocha tasted chocolate. it was delicious! i guess, chocolate is just chocolate. and, it isn't my favorite thing to eat. but, once in a while, it was nice to have a bite, wasn't it? Btw, seumur idup sih baru ngerasain 2 coklat yang bener2 enak. Which is: ROYCE' (yg jenis Nama Chocolate) dari Jepang, sama Australian Home Made dari Oz. Dua2nya lembut dan gak bikin eneg.